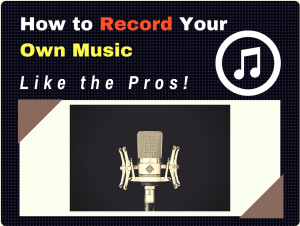 In this post we’ll go through the step-by-step process of recording your own music like a professional. 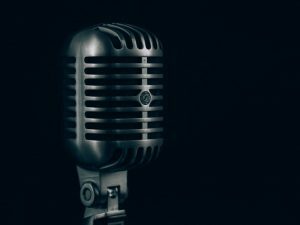 Whether you’re an aspiring singer-songwriter, producer, or even an amateur, by following these simple steps that I provide, you will have recorded your very first song on your own! Whether at home, or even in your bedroom. There are two ways you can go about recording your own music. Each way will be based on who you are and what you are trying to accomplish. There are actually online software that you can use for free to make simple recordings. The benefits of this is that you don’t need to have a whole recording setup — the online software is easy to use, as it’s designed for beginners. However, this option is only best for young students who are interested in learning the basics of music production and recording, and just want to have fun. If you plan on going this route, you will need to have a laptop, a get a USB microphone, and get either monitor speakers or headphones to get the best results. You’re probably not going to want the limitations of online software, and rather at least make good quality demos or singles in your home or bedroom. This method would require some investment in time and money on your part — but it will put you more in the “driver’s seat” of your own creative process. You won’t have the nightmare scenario of label execs or production company managers and engineers dictating to you how to record your own music. Luckily, a home recording studio setup is not difficult to put together. And you don’t need to be a pro to start. You can get quality recordings from just a few gear and software, and you’re on track to creating your own music. This will vary depending on what sort of recordings you’re making, but the principle remains the same. Once you have an audio interface, you’ll need to plug your microphone(s) and instrument via appropriate cables (if you’re using any) into you audio interface, then plug your interface into your laptop via USB or Thunderbolt (for MacBook). Then you will be outputting your audio signal (so you can hear and monitor your recordings) via studio monitor speakers or headphones. Depending on how many instruments or microphones you’re recording will be based upon your audio interface type, so make sure you get the right one. Follow this guide to see how. You’ll see this in pro audio discussion a lot. This simply means making sure that your microphones and instruments don’t “peak” at or over 0dB in your DAW. If it does, turn down the gain so that at its loudest the audio signal is between -12 dB to -6 dB. This way, you have enough “headroom” to play with. Read more how gain staging works and how to apply it. Now that you have the right gear for recording music, and the right setup, we can get into how to record your own music. This method can be most suitable for singer-songwriters who like to record while performing on an instrument. It’s best with a setup that doesn’t require a large number of instruments, such as in a band. Two or three instruments/people being recorded together should be fine. If you’re recording more instruments all together, the help of a hardware mixer would be of benefit to you. You can take a look at USB mixers as a simple solution. Just as the name suggests, you simple perform your music all the way through, or in chunks (verse, chorus, bridge, etc.) It’s advised to take multiple “takes” — meaning, record multiple times, and in various sections — of your songs. Get used to playing with what’s called a “click-track“ (also called metronome). 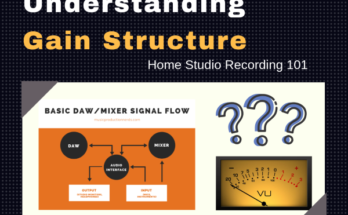 This will help you out in recording. As you record just, turn on the metronome in you DAW so that it plays through your headphones as you perform. This will make the editing process easier and simpler. Note: You can ignore this tip if your music’s style changes a lot in tempo, such as in classical music and some folk styles of music. This is a far more common approach. It gives you more editing power in your studio, and the ability to do more with your recordings. 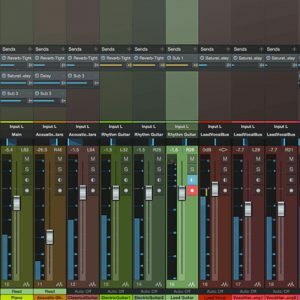 Whereas the live performance recording method is more suitable for intimate recordings, this one is best for recording a larger number of instruments at the same time. You don’t need your whole band to be together — it can get complicated, especially in some home studio setups, to record up to 12 microphone and instrument tracks at the same time. So in a multitrack recording, you can record the drum and bass in one instance. Then record the singer over the beat another day. Then another time bring a keyboardist, and so on. Now let’s get into the recording process. Whichever method you chose, there is a typical process that you need to follow when it comes to recording and producing your own music. What this simply means is to create a track that all the other musicians will be able to follow. Usually, pilot recordings consists of drum and bass only. Although, it could start with any other “rhythm” instrument, like guitar, keys, or even percussion. The idea is to get something simple and basic down to establish the groove, rhythm, tempo, and flow. Hence, “pilot,” as it is literally directing the rest of the recording. A good tip to practice is to record this initial pilot with a “click-track,” otherwise called a metronome. This way the engineer or you can make seamless edits and adjustments as we move into further stages. This is necessary, of course, only if you plan on recording a singer. If it is an instrumental, you an skip to the next step. Also, this step can be substituted for recording a lead instrumentalist on a track. The draft vocals is necessary to help the other instrumentalists know how to accompany the lead singer. Otherwise, you may end up in a nasty situation where keyboard, guitar, etc., players sound as if they are competing with the singer for musical space. BTW, some people like to include the vocals while they are recording the pilot. So step 1 and 2 can be combined if that suits you. Just make sure they are recorded onto separate tracks. Also remember, whereas you can record the pilot before the vocals, or even with the vocals, stay away from recording the vocals before the pilot instrumental. Vocalists are notorious for inconsistent tempo changes — they need something like a beat to keep them in check. Singing to a “click-track” is unnatural and wouldn’t be much help. Now we can add the rhythm section. Anything that plays “rhythmically” would be called a rhythm instrument. So piano or keyboard instruments vamping, comping, or grooving to the drum and bass, as well guitar chops and riffs — these are all part of the rhythm section. Percussion, if they are a major feature for your track, are also part of your rhythm section. Simply, harmonies will just play your chord progressions and are not designed to stand out too much. Harmonies are anything like synth pads, organs, or strings. They make up the “meat,” or the fodder of your song. They fill in the necessary spaces and add body to your song. At this point you can also have fun doing things like vocal doubling, or tripling, where the vocalist harmonies with him or herself. This is especially effective during the chorus or hooks, anywhere in the song that needs to be “bigger” or more emphasized. This is anything like melodic lines, guitar or synth leads, backup vocals, sound effects, additional percussion. They are the little sprinkles you add to your song that make them interesting in some way. It’s also an optional step, but a favorite among anyone recording their own songs. At this point, there are no rules, just have fun and do what feels and sounds good. Just keep in mind, don’t over do it, and in this case, less is more. If you feel you need any help at this point, you can always get some guidance from online courses from experts. Think of it like gardening, whereas the recording process was planting your seeds and watering them, allowing the song to grow from a simple idea to a recording, the editing process is pruning your musical garden so that everything looks, or rather sounds, nice and neat. As well as removing any weeds that happens to be in there. You’ve probably made several takes or recordings of different tracks. At this point, you get to decide how everything comes together. Sometimes, you may need to shorten the introduction, or even extend it by looping it. You may need to repeat certain sections. You may need to delete or mute section where an instrument was playing, or copy that section over to somewhere it sounds more suitable. This is part of the creative process, part of the reason why I said recording (at least the pilot) using the click-track is important. Now, you get the chance to move things around seamlessly, even change the song structure entirely. This refers particularly to the takes you’ve been recording. Sometimes a portion of one take will sound good, and the portion of another take will sound good. Maybe the rhythm guitarist played a nice groove in different places in different recordings and you want to capture them. This is where you can load up in your DAW, the different sound files and see which ones you want to choose over the other. While you were recording, there were bound to be some external sounds coming into your song. Maybe the breath of the singer, a hum or pluck from the guitar between chops or solos. Listen to your tracks. Where there is supposed to be silence, if any other sound not part of the music is in the recording, you can either cut it out and delete, or you can apply a gate plugin to attenuate the track to silence as soon as it the audio file falls below a certain threshold. When it comes to vocals, a very good plugin to use is the de-esser plugin, which acts like a multi-band compressor that attenuates the harsh “ssss” sounds in a vocalist’s recording. 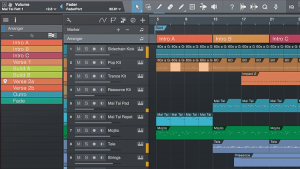 Your DAW may already come with one, but if you don’t find it or it’s not suitable, you may take a look at some of these more professional alternatives. Similarly, there are other noise reduction plugins that can be used to get rid of that unwanted noise easily and effectively. So you have your perfect arrangement, and the right comps for each track. You’ve also gotten rid all the unpleasant noises, and there is no external sounds bleeding through. Now, you can start looking into any timing issues. Now, come back with fresh ears. Listen to see if there are any timing issues. Did the vocalist start too early? Late? How about the keys, guitars? At this point, you can zoom in, simply grab and drag your sound files around until they fall into perfect alignment. There are also plugins that can help with this, and more than likely your DAW will come with something like a groove assistant to help keep the transients of your songs in perfect timing. A few singers don’t like this, while others can’t live without it. But it is very essential to your editing process. Pitch correcting and process are two different things. Pitch correcting simply means listening to see if a pitch in the vocals or instruments are not playing the right notes. Fixing it can be as simple as zooming in on the place where that note is played itself, right-clicking, and shifting the pitch up or down a certain amount of semitones. Pitch processing comes in when you need make voice or instrument play in tune more accurately. This doesn’t imply an “autotune” sound. The “auto-tune” sound is, believe it or not, a desired effect produced by the engineer. You can get your vocals sounding in tune without sounding like a robot. Once you’ve edited, pruned, and cleaned up your song’s tracks. We now need to do some basic mixing. Some of you, at this point, may feel that taking a course on the subject online would help. That’s totally fine. Simply bookmark this page and come back to it to complete you project. These mixing techniques are actually not very difficult. Some basic understanding of them will take you a long way. We’ll start with the easiest. You want to be able to organize your channels so that you can find things better. 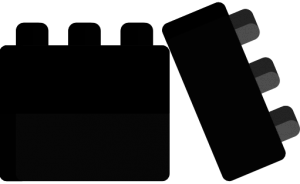 Self-explanatory, your drums channel group includes all your drum tracks (overhead, kick, snare, hi-hat), including your drums buss. A drums buss is a channel that groups all your buss together. Simply create a new buss channel, label it, and send all your buss channels to it. 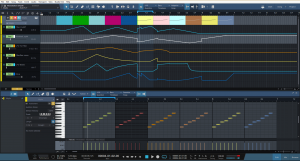 Many DAWs offer color organization. Read: How To Mix Drums. 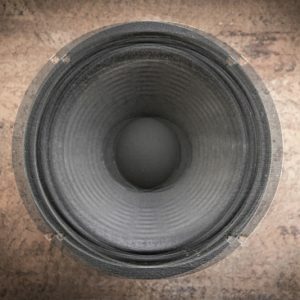 The bass channel is usually just one track. The instruments channel include all the other instruments, like piano, guitars, organs, synths, etc. It’s also a good idea that if you have different tracks of the same type of instruments, like guitars, then create a guitar buss, keyboard buss, etc., and send all the keys and guitars to their respected busses. Once you’ve done that, create an instruments master buss and send all the instrument busses to this one buss. This can consist of main vocal track, plus doubling track if you used any. I like to color this in shades of yellow. Again, you can also buss this into one vocal buss if you used many vocal tracks. Finally, send all the channels or buss to the mix buss. Now that you have organized your mixer we can do some… mixing! This is to make sure that things are not too loud or too soft. Maybe the vocals need to be more upfront — you can turn down all the instruments instead. Simply use your ears to guide you. You can pan sounds, like guitars or keys to the left of the right. This will add stereo width as well. It’s a good idea also to get another song in your session to reference to see how well your mixing is in terms of balance. Don’t be bothered too much about whether or not it is loud enough, we’ll get to that shortly. Sometimes, no matter how much you turn up a track, it’s simply not loud enough. Compression is a great technique where the dynamic range of your audio signal is “compressed” so that softer sounds are made louder. With a little compression on a channel, buss, or mixing buss, you raise the “presence” of quiet tracks without pushing your volume into the red. 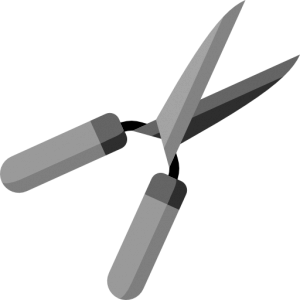 You use this to cut out, as well as enhance, each instrument’s unique frequency signature so that each instrument is heard clearly. For instance, the vocals are a mid-high frequency sound. 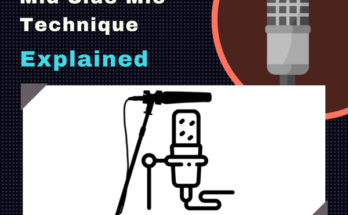 So you want to cut out any low rumbles that the microphone might pick up. The guitars are generally higher frequency sound as well, so you want to cut out any low end from them either. Doing this allows the kick and the bass to come through and not compete for space. When it comes to finalizing your EQs, on the Mix Buss, temporarily twitch it to “mono.” This will add some clarity in now to boost or attenuate some instrument or vocal frequencies to allow each track to sit well in the mix. It’s not that difficult to hear, because you can “tell” when things don’t sound good on a good pair of monitors. The two most common effects used are reverb and delays. Reverb adds “space” to a mix. On vocals, they make them sound less “dry.” A little reverb can make a singer sound like she was recorded in a great hall. Delay adds echo. This is used similarly to reverb to add space. Other times, a little bit of a 1/4 note or 1/8 note delay sounds cool on things like guitars or keys. This is not anything you do to your music itself, but rather a way of making things easier for you. There are times you may want to increase reverb, take away delay, increase volume of a track, and so on, as the mix plays. 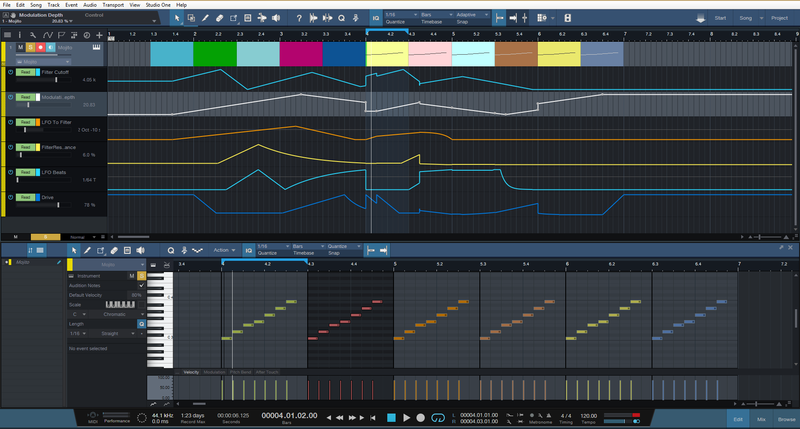 With automation, you can draw lines in your track telling your DAW to perform these functions for you automatically. The topic of mastering is a fairly complex one. Some people think you shouldn’t master any music until you’ve studied it like one would study the dark arts of alchemy for 15 years with a hobbit wizard in an eastern European cave. Sure, if you want Grammy level songs, it might be better to outsource this job to a qualified mastering engineer. 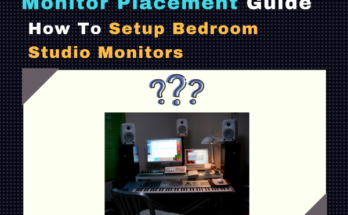 But if you’re simply wanting to get your songs out there, getting a good pair of studio monitors, and a little know-how will be just enough. And if your songs ever get super popular, there’s always “re-mastering,” for industry level commercial release. What I’m going to talk about is the basics. a. First, by this point you should “bounce” down all your tracks to a single stereo track after mixing. Make sure you left enough headroom in the main channel. You’re final mix should be peaking no higher than -3dB. This allows you some room to adjust dynamics. b. Start a new project or session and import that stereo track to it. Also find a commercially released track similar to yours, in the same or similar genre, to reference. c. Use a free metering plugin by T-Racks to monitor the loudness of your mix as you begin to work. Some DAWs come with a similar plugin, but if you can’t find it, download it from this link. Once your stereo track is loaded in a new project, place a compressor on the master. This compresses the dynamic range so that the average loudness remains as loud as possible. Use a multi-band compressor to isolate certain frequencies so that they remain within a certain dynamic range. Listen to your song over and over again. Listen where the bass, mids, trebles seem inconsistent. Isolating these frequencies, compressing them, then attenuating or adding more gain, gives you the ability to provide a more consistent loudness level throughout your song. By using a special plugin, you can make the higher frequencies wider, which adds a sense of space and width, as well as the impression of “size” to your music. This gives your music the impression of loudness. Just a little analog saturation will add a little color to your mix, and thereby make it a little more exciting. Even though it doesn’t make it louder, it has the impression of making your music sound louder. Analog saturation simply refers to that “fuzz” that you get from playing music through an analog devise. Everything is often clean and clinic in the digital world — depending on the nature of your song, a little character will go a long way. Finally, adding some moderate limiting will make sure you can bring your track to as close to 0 dB as possible without running the risk of clipping. While practically any limiter plugin would work, you’ll want something that’s as transparent as possible. Read: applying the right limiter settings to a song to get it to right loudness level. Great, you’ve made it! It may have taken some time, but to the few of you who have taken the journey, I have to say I am proud of you! You’ve recorded your own music, like a pro. And you’re set for recording many and many more songs from now on. And guess what? It will only get better with time. One More Thing – Want to make some money?